My new book is heating up this summer! I have exciting news to share! My new book, HIDDEN HEAT, is a finalist in two contests: The Maggie and the Tara! I couldn’t be more thrilled. Finaling in the Maggie is a long-time dream come true. I will be attending the Moonlight and Magnolia’s Conference in Georgia in October to participate in the awards ceremony. I have to find the perfect dress, so I can be sure to sparkle. This year is all about starting over with a clean slate. I went back to Weight Watchers, started the #50wordsadaychallenge, and received the exciting news that I’m a finalist in the West Houston Romance Writers THE EMILY contest! What a way to start the new year! I had a blast at RWA17! We arrived on Tuesday, and kicked things off with a group dinner at the Big River Grill, within walking distance of the Swan Hotel. Being surrounded by my peeps (other writers) is the best feeling ever. They get me. They understand. I don’t have to explain. Wednesday, I reconnected with friends I hadn’t seen in far too long, for a lovely lunch at Fresh Market, inside the Dolphin Hotel. It was a great salad, but the desserts were to die for! And, Wednesday night was the long-awaited DEATH BY CHOCOLATE party, hosted by the Kiss of Death chapter. I dressed up in all my finery, full makeup, hair and gown, and made the trek from the Swan over to the Dolphin. Yeah, you guessed it, the Florida heat didn’t look good on me. But I pressed on, knowing I would soon be drowning in chocolate. Uh, not so much. The only chocolate to be found at the party was a chocolate dipped strawberry. That meager serving was a little disappointing, but the party was not. I received Honorable Mention for my romantic suspense novel, CRIMINAL HEAT! And, cheered for my good friend, Lena Diaz, who won her FOURTH Daphne! She is the Daphne Queen! Thursday, I attended the PRO Retreat, and was moved to tears by Alyssa Day’s wonderful talk about “Writing and Mental Health”. The Retreat was well organized with round table discussions and lots of prizes, as well as food! Unfortunately, I missed the Rita’s on Thursday night. My mother was in a car accident and I had to go home and make sure she was okay. Thank goodness, she is, but it was scary there for a while. Can I just say my husband is my hero? He dropped everything and came to get me. And my roommates are amazingly supportive, wondrous women I am privileged to know. I made it back to the con in time for Editor/Agent appointments on Friday. I came away with three requests! Next up, THE GATHERING, hosted by the FF&P chapter. My friend, Debra Jess, took third place in the Novella category of the PRISM AWARD with A SECRET ROSE. Super proud of her! And, I finished the day with a room party, hosted by Lena. So fun! Saturday morning, I attended the Chapter Leadership Breakfast where I met other chapter leaders and soaked up a ton of great information. This was also well organized, and so beneficial. During the conference, I attended some exceptionally good panels. I will mention two of my faves: Anything by Geoff Symon, and “Locked and Loaded: Pulling the Trigger on Military RS”: Lynn Raye Harris, Cristin Harber, and Laura Kaye. The big finale came all too soon as we roamed around the Literacy Autographing with hundreds of authors. I’m proud to say that over $40,000 was raised for literacy. Romance writers are givers, and we need all the readers we can get! I’m thrilled to announce that my romantic suspense novel, CRIMINAL HEAT, is a Daphne Du Maurier Award for Excellence in Mystery/Suspense finalist! I simply can’t wait to attend the Kiss of Death Chapter’s DEATH BY CHOCOLATE party at RWA National in Orlando in July! 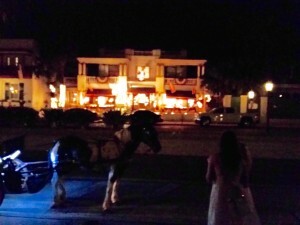 This summer I realized a long time dream by staying at the historic Casablanca Inn in St. Augustine, Florida. 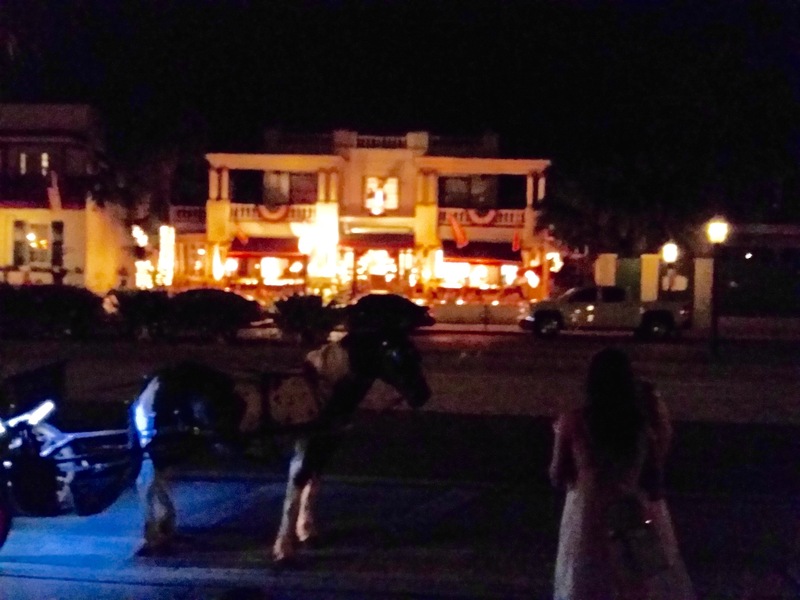 I’ve visited many times and gone on the ghost tour where they tell the story of the owner, a savvy businesswoman who made money off both the Federal Agents who stayed at the Inn, and the smugglers (rum runners). The Casablanca Inn overlooks Matanzas Bay and she could go up on the widow’s walk and signal the smugglers with a lantern when it wasn’t safe to come into town. The story is, people still see this light at night. Cool, right? 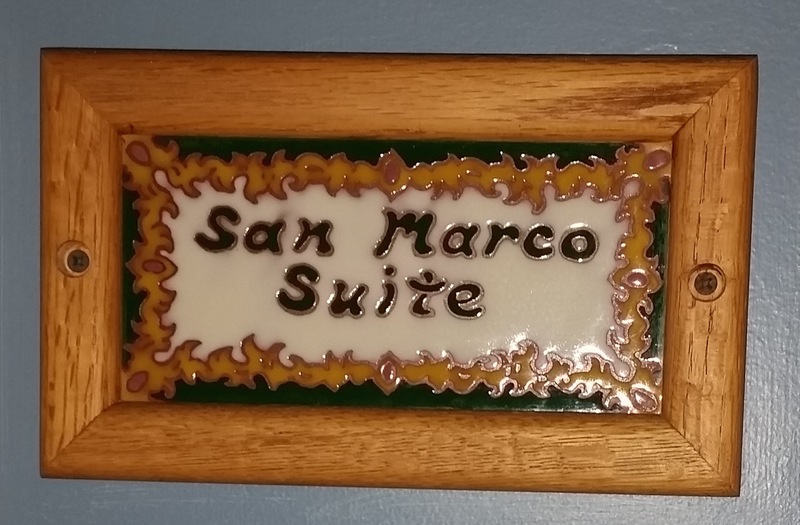 We stayed in the gorgeous San Marco Suite. It had a comfy sleep number bed and tons of pillows. Decorated with antiques, I felt like I’d gone back in time. The last night of our stay, we took a photo of the Casablanca all lit up at night. Later, when we returned to our suite, I scrolled through the photos and made a startling discovery. I distinctly remember waiting until no one was in front of me before taking the picture of the Casablanca. I remember, because my daughter was impatient to get going. Well, there are some people in this picture I don’t remember being there or seeing at all. I must have had a look on my face because my daughter asked me what was wrong. I questioned if she remembered anyone standing in front of us when we took the picture. She told me no, you made me wait until everyone got out of the way. I handed her my phone so she could look. All the blood drained out of her face and we both got tears in our eyes. All the hair on the back of my neck was standing on end. And it didn’t end there. At that point, I strongly felt someone was watching me from the other room, sitting on the bed. I snapped some photos, but saw nothing odd. I finally said, “If you’re here, let me see you”. And the most amazing thing happened. A ball of light formed right where I thought she was sitting, hovered, and then flew through the wall into the bathroom. I was stunned, every nerve tingling. I’d had an intelligent, visual response from a ghost! I got up and went into the bathroom to find all the drawers in the vanity hanging open. Neither my daughter, nor I, had opened them the entire time we’d been there. What an exit! During my lifetime I’ve had a lot of spooky experiences, but this was special. 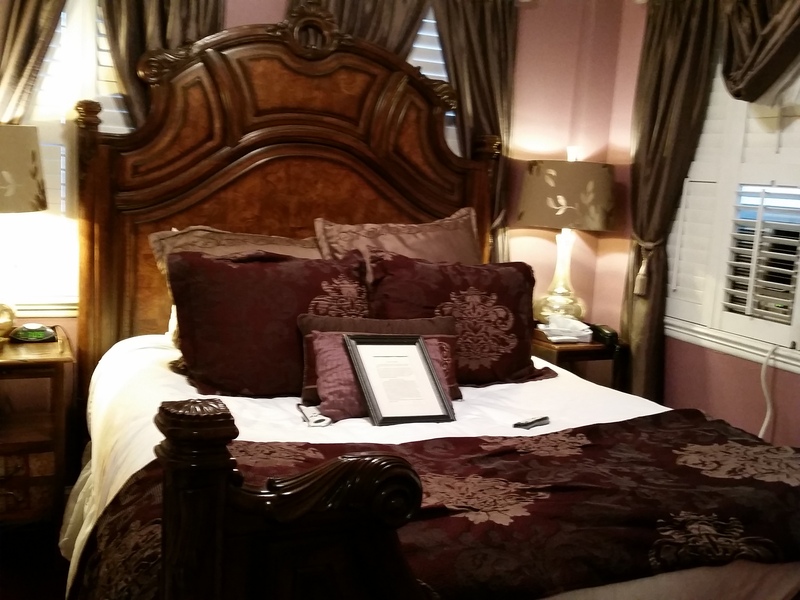 The whole time I stayed there, I knew there was a lady in the room. But she felt welcoming and protective. I slept like a baby in that place and I never sleep well away from home. I don’t know who she was, but I got the name, Liliana. I don’t know if she was the same lady in the picture out front, or someone different. But I’m grateful she let me “see” her. In October 1995, I tested for my first degree (dan) black belt in Tae Kwon Do. The final requirement at the end of the test is breaking. I had to choose between two stacked boards or a concrete slab to be broken with a hammer fist. I watched the first line of people attempt their breaks. Many who attempted the slab failed, even a lot of the guys. Here’s a little tip, if you don’t break concrete on your first attempt, don’t try again, waste of time. Your body knows what’s coming and you will subconsciously hold back to prevent further pain. It’s not going to break. Most students who didn’t break, finished with their feet, and their teachers were down doing pushups. See, the student should not be presented for testing by the teacher if they’re not ready. It’s on the teacher if they fail, so they are the ones doing the pushups. Just how it works in martial arts. My teacher appeared before me. He indicated the slab or the two boards. I knew what would be easier. I had successfully broken two stacked boards with a hammer fist before. He knew this. I’d never broken the slab, but I wanted it. Call me crazy, but I nodded to the slab. I know by this point, he was tired of doing pushups, but without a word, he set it up for me. I lined up to the slab and stared it down. All I could think about was how that slab was between my black belt and me. I didn’t think about technique. That was already ingrained through many years of training. Inside of all of us, whether we know it or not, is a power we rarely, if ever, tap into. That day, I found it. When it was time, I went through that slab of concrete like a knife through butter. It was easy. In fact it was so easy, at first I couldn’t believe it. But there it was, in two pieces. And there was my teacher, his face broken into a huge smile. I’d done it. No more pushups today! I still have that slab. The two pieces fitted back together and displayed on top of a bookcase. For a long time now, I forgot about that secret power I have inside. The power we all have. I’ve allowed life to beat me down and I’ve doubted my ability to use my power. This morning, I woke up dreaming about breaking that slab and how it felt. I think it was a message. I’m taking my power back. I’m going to believe in myself again. I’m going to demolish the obstacles standing in my way. I’m going to make it happen. How about you? Every New Year, I think about what I want to accomplish. Yes, the dreaded resolution. Last year, it was simply to be more positive. It’s an ongoing battle, but I think it’s helped my overall attitude. This year, I really want to lose weight. Just thinking about it has me breaking out in a sweat. You see, I’m a lapsed lifetime member of Weight Watchers. I know what it takes to lose the weight and it overwhelms me. I was wavering, thinking, how can I do this again? When out of nowhere, it struck me. Just go to a meeting. Break down that goal into little steps and celebrate each one. Don’t think about the final objective, only the thing you need to do today to make it happen. It was an epiphany, aha moment, and I had to share. Whatever your resolution is, you can do it. Don’t think big picture, think about one thing you can do to move a little closer to the goal line. It helped me, hope it helps you, too! Wishing you all a Happy New Year filled with many celebrations! In a series of recent conversations with friends and family, this subject kept coming up. It made me think about things I learned as a young child that stay with me today. Things I do that I never thought about why, until I took the time to reflect. For example, I never leave my gas tank on empty, and it gets me super aggravated if someone else drives my car and does it. Why? I thought about it, and realized this is something I learned from my grandfather. He was religious about it. He always kept his gas tank full. He lived through a time when gas was rationed. My Aunt Mary told me there was an emergency situation when my grandpa didn’t have gas. He had to gather ration slips from friends and neighbors. I know he wanted to make sure this never happened again. Without my realizing it, he passed this little quirk down to me. So, if there’s an emergency, my tank is full, people! Children are like little sponges. Whether we realize it or not, they absorb everything. It’s important we share our history with the younger generation. I’m saddened when I realize that so many of our youth can tell you all about the latest reality show, but have no idea what country we won our independence from or who fought in the Civil War. They don’t know what happened on the Beaches of Normandy or at Pearl Harbor. It’s a national tragedy that they don’t. Make it your mission to educate the young minds in your life, especially on this Veteran’s Day. Remind them why we live in a free country and must be ever vigilant to keep it that way. Sincere and heartfelt thanks to our veterans and active duty service members. May God bless and keep you safe. Happy Veteran’s Day! I attended the Georgia Romance Writers Moonlight and Magnolia’s conference October 10-12 with Volusia County Romance Writers chapter mates and friends, Carla Mueller and Diane Burke. The very first night at the bar, I ordered the hotel restaurant’s signature drink called The Cherokee Rose. It would not be the last time…. The next morning, I was happy to find First Coast Romance Writers chapter mate, Marie Long at breakfast as well as new friend, Kim Castle. And then it was time for my pitch workshop hosted by Maggie Finalist, and ultimate Maggie winner, Jennifer Delemare. Did I luck out or what? Immediately after, it was time to put my pitches to work. I met with literary agent, Nalini Akolekar, who requested partials of both my romantic suspense and paranormal work. Way to start the day. After many excellent workshops, I ventured off to my second agent meeting of the day. Stefanie Lieberman requested I send her a sample of my romantic suspense. I finished out the day at Mambo Italiano joined by friends, Marie Long, Carla Mueller, Diane Burke, and Kim Castle. The servers wore T-shirts that said, “The taste that makes you want to mambo!” Much laughter and good food, combined with live music, sent me to bed happy. The next day, I met with Sourcebooks editor, Mary Altman. I had so much fun pitching to her and she requested both manuscripts as well. Three appointments, five requests =Yay me! To celebrate, you guessed it, another Cherokee Rose. I think I deserved it. I know the next question, what’s hot? At the agent/editor panel, I heard they are looking for M/M Military Romance, ménage, and Civil War Romance. Vampires are dead. LOL! Still open to werewolves, but paranormal is currently a soft sell. Sue Grimshaw predicted historicals are starting to make a comeback and will be hot again within the next two years. They are currently looking for Western historical, highlanders, and modern day cowboys. The last day of the conference was all about writing love scenes your readers won’t skip. During Roni Loren’s workshop, we were asked to share the most memorable love scenes from books or movies. Pretty much any movie with Patrick Swayze qualified. Who can forget the scene from Ghost, making clay? And Dirty Dancing? Did someone turn on the heat? Thank God for that paddle fan included in the goodie bags. Whew! We finished off the day with a trip to the local movie theater and Dracula Untold. Great job of mixing traditional mythology with actual history. I loved it and hope there will be a sequel. To top it all off, I came home to some unexpected news. After judging my contest entry, Cheryl Yeko of Soul Mate Publishing requested my full manuscript. I hit send on all my submissions this afternoon and now feel in need of a stiff drink! Oh Cherokee Rose, wherefore art thou? I’m a goal oriented person. I believe in making small, realistic goals I can easily achieve. However, I also have bigger, long term goals that are increasingly elusive. Recently, I shared this frustration with a friend who made an interesting observation. She suggested that I focus on the process rather than the result. The idea intrigued me. My two big, long term goals are losing weight and selling books. I’ve had these goals for many years with varying levels of success. I’m a lapsed Weight Watchers Lifetime Member. That means I did achieve this big goal, but have since regained the weight. I have yet to receive a publishing contract. But, I do have a body of work that has done well in contests, been requested by editors and agents, and come super close to selling. So let’s break this down. If I make better food choices, watch portion sizes, and increase my water intake, I will feel better even if I don’t reach a magic number on the scale. And, if I continue putting words on the page, learning my craft, and submitting, I will be closer to success than if I did nothing! More so, I will be better prepared to hit the ground running when the time comes. Instead of zeroing in on the fact that I have yet to achieve these two goals, and feeling like a huge failure, it’s beneficial to realize that I am doing the things necessary to get the results I want. If I stay focused on the process and the fact that I’m doing the work, I’ll be less likely to feel discouraged. And in the end, the results will be exactly what I hoped and dreamed. I’m going to give it a shot.